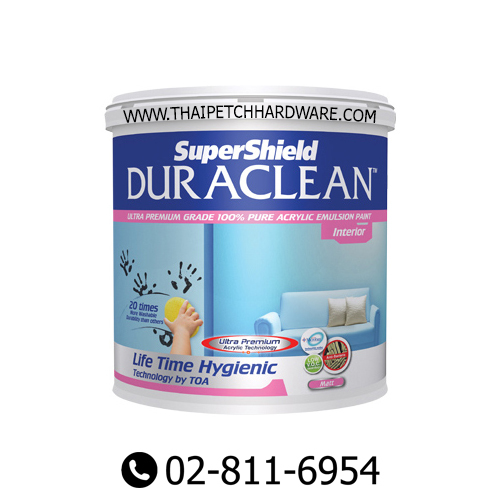 SuperShield Duraclean™ is Ultra-Premium interior paint. Superior washability and scrub resistance. - Easy washability and scrub resistance more than 60,000 times. - Low VOCs.safe for everyone. - Anti-bacterial for lifetime by Microban. - Low odor,certified by Thai green label standard. - Suitable for Green Building standard. Suitable for : interior,Suitable for areas that require highly hygienic ex. Bedroom, hospital, kindergarten, or areas require extra low odor ready for moving in within an hour ex. hotel, corridor.